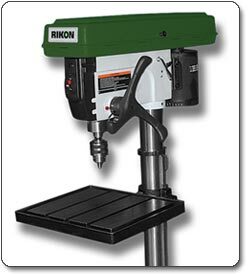 Built to last, and full of features that help increase productivity, the RIKON 30-240 20-Inch Floor Drill Press is ideal for professional or do-it-yourself use. Its steel and cast iron construction combines with easy adjustments for powerful, efficient performance. Whether you're working at home or in a commercial shop, the 30-240 gives you more options to get the job done right. 1/3-horsepower, 20-inch floor drill press for professionals or do-it-yourselfers. The 30-240 owes its efficient performance to a robust 1-horsepower TEFC motor, which ensures consistent, controlled power. 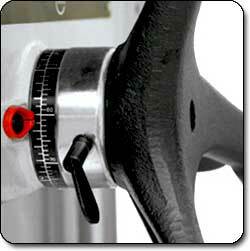 It also features a 20-inch swing and provides 16 spindle speeds from 150 to 4,200 RPM. For added flexibility, its head tilts 45 degrees right or left--a great feature when you're angle drilling. To give you the versatility you need to tackle a range of jobs, the 30-240 features rack and pinion table height, which makes adjustments a simple matter of turning the large handles. You'll never have to worry about breaking or bending the handles as you work--they're made of solid cast iron for exceptional durability. To ensure precision and to save you time, the 30-240 also offers the convenience of a clutch depth stop, which makes it a snap to quickly set the drill depth. This feature is particularly helpful during repeated drilling. And to maintain an organized space where everything you need is at your fingertips, the 16-1/2 by 18-3/4-inch table includes slots for quick mounting of your jigs, vises, and figures. Designed to be reliable year after year, the 30-240 boasts the durability of solid steel and cast iron construction. The rugged design and materials allow for vibration-free performance, which helps to improve accuracy and consistency. The 30-240 has a height of 68 inches, weighs 318 pounds, and is backed by a two-year warranty. RIKON 30-240 20-Inch Floor Drill Press with table, chuck, one bag of loose parts, drill press head, feed handle, column assembly, base, one bag of belts, and owner's manual.